Instead of enjoying her senior year of high school in Ohio, Caroline Kelly unexpectedly moves to Cairo, “where the government is not super-stable and the fear of terrorism is real,” so her mother can fulfill a dream of opening an eye clinic in “Garbage City,” home to Cairo’s most impoverished inhabitants. A practicing Catholic, Caroline is eager to learn about Islam and Egyptian culture, but she struggles to adjust to the crowded urban environment, the mosque’s predawn calls to prayer, the fact that she needs a driver to take her around the city, and frequent sexual harassment. A growing friendship with her driver’s teenage children, Adam and Aya, helps her acclimate, and things look up when she discovers that her crush on Adam is mutual. With humor, sensitivity, and empathy, Doller (The Devil You Know) conveys the complexities of an interfaith, intercultural romance: the blatant disapproval from Adam’s family and friends, her parents’ worry (“The kind thing to do would be to leave him alone”), and Adam’s own doubts. It’s a tender story that’s both realistic and hopeful. 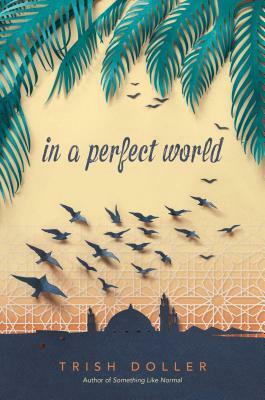 Doller paints a vivid picture of an expat-teen’s life in Cairo: part fascination, part fear, and a little bit of guilt. With detailed descriptions of popular and less familiar tourist spots; mouthwatering descriptions of Koshary, ful, Gebna makleyah, and other foods; and a bit of Egyptian Arabic, this is the perfect tour guide disguised as a YA novel. The straight forward story—a teen falls in love with a new city and a boy—belies the important lessons learned in this story. The theme of the novel is not subtle: Egyptians are different from Americans, but they are also similar; people who are different are also similar. Caroline blushes when she catches herself making assumptions: why would she think that Egyptians would not enjoy reggae, heavy metal, and Harry Potter? The reader learns, through identifying with Egyptian culture and people and with Caroline’s expanding perspectives, to examine their own filters through which they see “others.” This book is a quick read which will inspire discussions, travel, and perhaps a bit of empathic understanding about people who are different from the reader.—Beth Karpas.